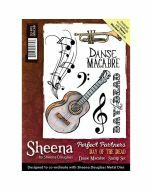 This metal die is designed to co-ordinate beautifully with 'Danse Macabre' A6 Perfect Partner Day of the Dead unmounted rubber stamp by Sheena Douglass. This pack includes 2 individual die. The largest die size is approximately 3.5" x 3.3" (88mm x 84.8mm).